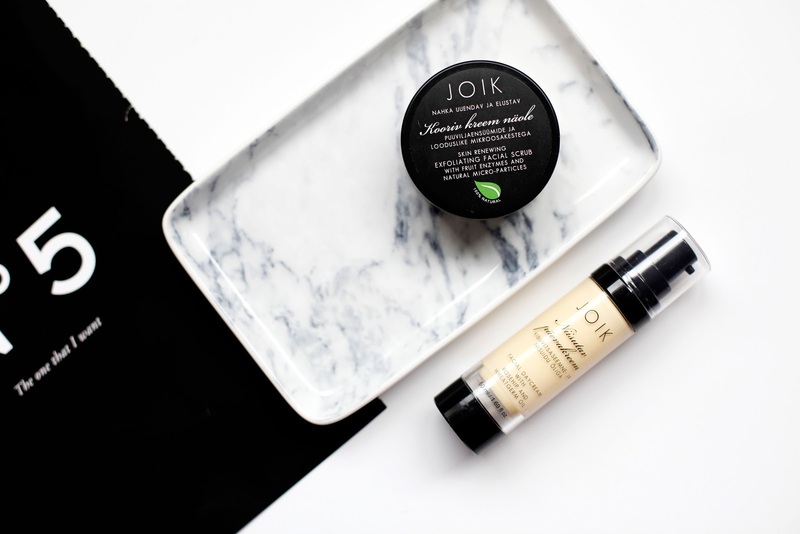 Here is what JOIK have to say on their website: "JOIK cream-based micro-exfoliating facial scrub effectively but gently removes dead skin cells, improves skin tone and gives it a healthy glow. The scrub contains skin-renewing fruit enzymes with natural AHA acids, which help in skin regeneration. Fine olive stone and bamboo granules exfoliate while coconut oil, shea butter and sunflower oil moisturise and nourish the skin. Regular exfoliation also prepares skin for better absorption of nutritional ingredients from other facial care products." The packaging is minimal and simplistic, beneath the screw cap is a lift-out plastic protector to keep the product safe during travel with little plastic spatula for hygienic dispensing of product. The scrub is creamy in texture and spreads easily over the skin, with the fine exfoliating particles. There's a slight oily residue left on the skin after rinsing, so it leaves face hydrated. JOIK Skin Renewing Exfoliating Facial Scrub is available in the UK from Love Lula, priced at £19.90 for 75g of product. 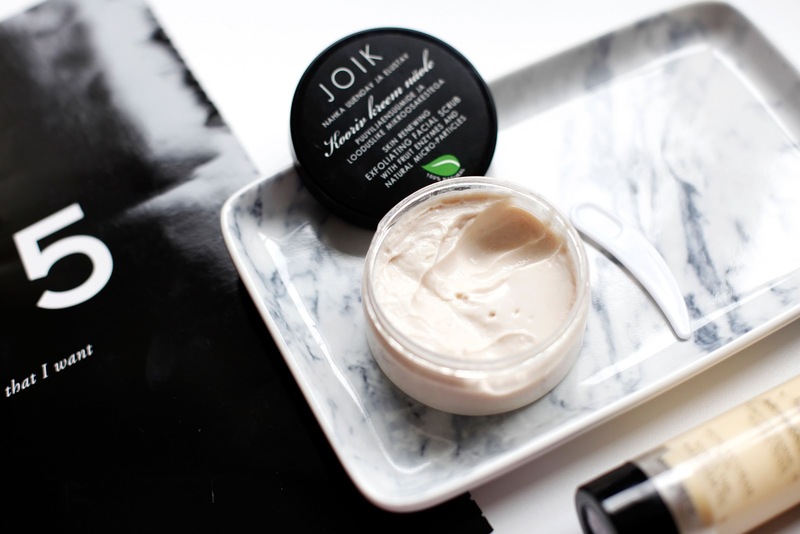 Here is what JOIK have to say on their website: "JOIK day cream with rose hip, wheat germ, carrot and jojoba oils moisturises efficiently, improves skin tone and protects skin from environmental damage. Our day cream is specially formulated to absorbe quickly and leave skin smooth and velvety and is therefore well suited for use under makeup." This day cream is very light, absorbs quickly into skin, leaving it silky and smooth. It does not contain any synthetic colorants or fragrances. It smells more wheat germ oil than rose hip. * Rose hip seed oil is rich in vitamins A and E, which help to boost skin cell regeneration, restore the collagen levels in the skin and keep the skin younger looking for longer; * E vitamin-rich wheat germ oil nurtures the skin and protects it from environmental damages; * Jojoba oil and shea butter moisturize efficiently; * Hibiscus tea and carrot seed oil give the cream nice pinkish color and a good dose of vitamins C and A, carrot seed oil helps to improve skin tone. Joik Facial day cream with rose hip and wheat germ oils is available in the UK from Love Lula, priced at £18.00 for 50g of product. 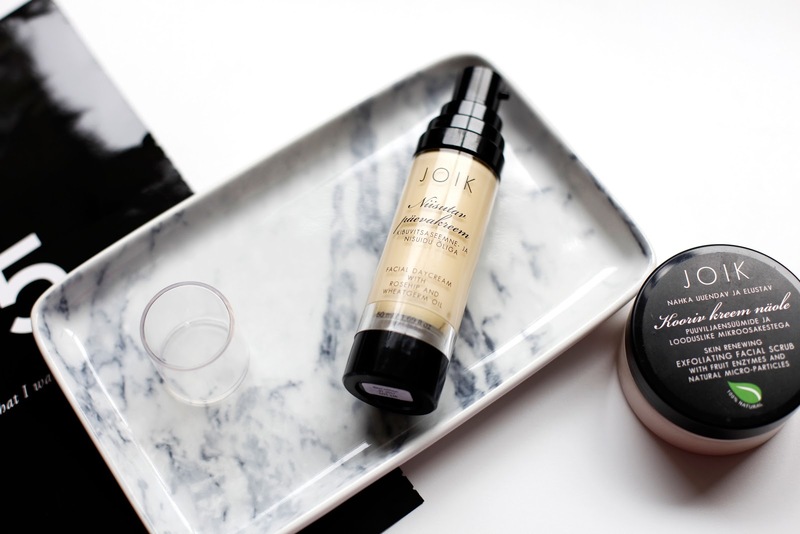 Have you heard of JOIK before? Have you tried any of their products? RUS: Сегодня хочу поговорить о натуральной продукции эстонской компании JOIK, которые выпускают уходовую косметику и свечи. Скраб для лица находится в простой минималистичной упаковке. Имеет защитную крышку и лопатку для использования скраба. Скраб очень кремовый, но также имеет мелкие отшелушивающие частички, похожие на дробленные абрикосовые косточки. После скрабирования кожа остается слегка маслянистая и очень увлажненная. Дневной крем с маслом шиповника и маслом зародышей пшеницы имеет очень легкую консистенцию. Быстро впитывается, неплохо увлажняет, пахнет травянисто, не шиповником. А вы пробовали продукты от JOIK? Favorite cosmetics ;) With Joik I had positive experience using their body oils, lotions, scrubs from the skincare products. Also their bath truffles, soaps and aroma candles are absolutely amazing. by the way, prices in Estonia are way affordable than in the UK, therefore I usually prefer JOIK to The Body Shop.